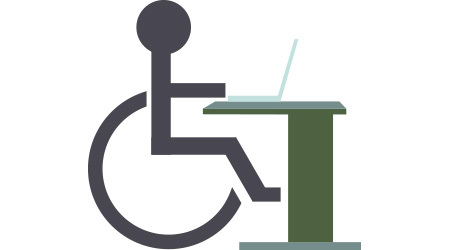 First of a two-part article on how the American Disabilities Act should shape planning for open office plans. When the Americans with Disabilities Act (ADA) went into effect 25 years ago, its purpose was to provide to people with disabilities the same rights, opportunities, and protections available to everyone else. And while ADA has certainly been successful overall, compliance challenges still remain. Perhaps paradoxically, the trend to more open office spaces has both exacerbated and eased these challenges. While more traditional closed-office design already was being replaced by more open office settings at the time the law went into effect in 1992, the trend has only accelerated since then, with more space being devoted to collaborative areas and less to personal workspaces. According to data released in July 2015 by the Centers for Disease Control and Prevention, 53 million adults — or 22 percent of the U.S. population — have some kind of disability. And that number — based on the 2013 Behavioral Risk Factor Surveillance System — did not include hearing disabilities. It included mobility, cognitive, vision, self-care, and independent living limitations. In general, the move to more open, flexible office layouts has been good for accessibility, say experts. “Open work spaces are much more beneficial and useful from an ADA standpoint,” says Joan Stein, president of Stein Consulting. “Walls, partitions and doors are all potential barriers and also present the greatest opportunities for errors in design and construction.” For example, says Stein, a minimum of 32 inches of clear opening width is required for doorways. Take away the door and the issue goes away. The same goes for the need for maneuvering clearance at a door to enable a wheelchair user to approach and open the door. No door, no need for maneuvering clearance. But the move to more open work environments hasn’t eliminated ADA compliance issues. That’s why it’s important for facility managers to have a solid grasp of the requirements of the law, and of the issues that can arise in open workplaces. These five points can help facility managers ensure that open offices and other spaces comply with ADA. It’s important to remember that ADA isn’t the only set of legal requirements when it comes to accessibility, says Rich Sternadori, education coordinator at the Great Plains ADA Center. For example, there is also the International Building Code. The two “are not exactly harmonized,” Sternadori says, but regardless of that “any architect or designer has to work with both documents.” Beyond these, state and local governments may have their own rules and regulations that also must be adhered to. While ADA is not a code, ADA standards sometimes reference specific codes. “This means a designer must use the referenced codes to meet the Federal standards” says Sternadori. Like other experts, Sternadori, who also is an instructor in the Department of Architectural Studies at the University of Missouri – Columbia, says that when there are fewer walls, fewer doors, fewer 90 degree turns, and fewer partitions, it is easier for people with wheelchairs, canes, and walkers to get around. However, these open spaces have their potential issues as well. “One of the more interesting challenges is space used for collaboration,” says Safranek. These shared spaces can take a variety of forms, from traditional conference rooms to open areas where mobile tables are quickly moved for impromptu meetings. ADA issues may arise with these spaces depending on how they are used. For example, Safranek says, “can employees routinely use a vacant conference room as a makeshift employee lunch room?” ADA considerations are also affected by who has access to the room or space. Are outside vendors allowed to use it? Consultants? Speakers? Another point to keep in mind is that it’s not enough to comply with ADA within a space, says Sternadori. Also important are the approach, entry, and exit. Approach focuses on “getting in a door, being able to manipulate a door, whether it’s a pull or a push.” Entry addresses issues such as how high the threshold of the entryway is. Another issue has to do with the use of strobes. While strobes are important to alert people with hearing disabilities, flashing can trigger seizure disorders. One example has to do with where strobes are placed and how they are spaced relative to each other. “Proper designing involves having enough strobes to adequately cover square footage based on decibel levels and visibility,” says Sternadori. “In an open floor plan strobe placement and quantity can be adjusted accordingly: More doors and walls may necessitate more strobes.” ADA standards reference code provisions that set flash rates and decibel levels to try to prevent the onset of most seizure disorders.